Tonight’s episode of THE WALKING DEAD “Killer Within” was the best episode so far this season and maybe even last season. Did you watch the episode? If you missed any of it, you can read the full and detailed recap HERE. T-Dog met his maker tonight when he got bit on the shoulder by a walker and then afterwards, in an attempt to save Carol, sacrificed himself up to walkers. Lori had her baby, Maggie performed the c-section that saved the baby girl but Lori couldn’t make it and little Carl knew what he had to do, shoot his mom so she didn’t turn. Carl is the new “badass” on the cell block. Can you even imagine what this kid is going to turn into after he has to shoot his own mother? You know how they say that most things come in three, well seems to be the same for The Walking Dead because Carol’s bandana was found by some gruesome remains. With all the chaos tonight, we can’t forget that someone left a bloody heart on the ground, did it belong to a human or a walker? On next week’s episode, three graves are dug which leads us to believe that Carol is in fact the third person that they will be burying, after all, it’s not like the group is going to dig a grave for Andrew the prisoner after he tried to kill Rick. Rick is struggling to come to terms with Lori’s death while Glenn tries to help him get his spirit back and the rest of the group take care of the baby. Everyone is mourning the loss of their friends but three graves have to be dug and supplies found for the baby. Elsewhere, in Woobury, the Governor hosts a celebration for his community while Michonne keeps getting more suspicious and wanting to leave more than ever but Andrea insists leaving is the wrong thing to do. You want to miss the next episode of The Walking Dead, don’t forget to come right back here to CDL for the live recap. 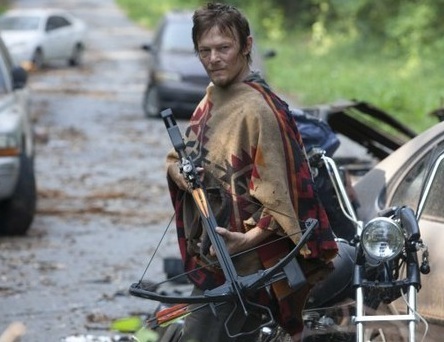 he Walking Dead Season 3, Episode 4 “Say The Word” airs on AMC, November 11th, 2012. Check out the preview video of episode 4 and let us know in the comments below what you think!